Since the 2018 midterm elections occurred in early November, several Congresspeople have made a splash among the younger demographic of voters. 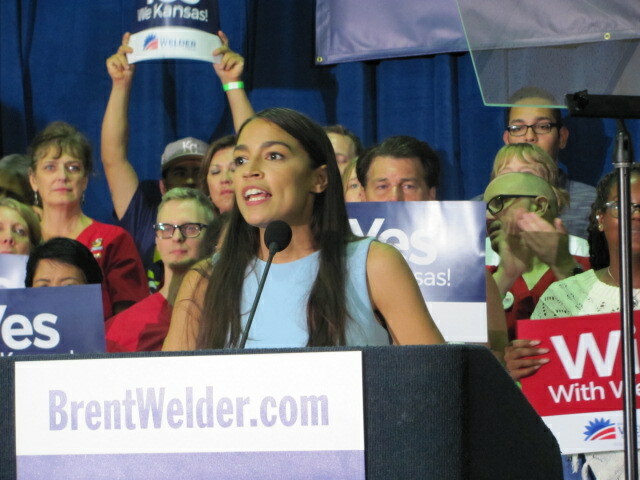 One woman in particular who has caused a great deal of commotion is Democratic Representative of New York’s 14th Congressional District, Alexandria Ocasio-Cortez. At only 29 years old, Ocasio-Cortez, or more commonly referred to as “AOC,” has gained a remarkable cult following in the few short months since she has been elected. Many of those followers have come from the youngest group of voters, who seem to appreciate her ultra quick wit and fresh ideas. Additionally, many of those people seem to be literal followers, referring to her combined total of 4.68 million followers on her public Instagram and Twitter accounts. Many people, myself included, have clicked that little blue button, signing up to see whatever she has to say and whenever she has to say it – which is the inherent beauty of social media. However, many people have not been so quick to jump on the bandwagon of social media and politics. In more recent years, and to be rather blunt, throughout the most recent presidency, it has become a growing concern that this informal and rather new form of communication may have no place among the political scene. While I will agree wholeheartedly that I have seen some things on Twitter from our current president that have made me want to delete the app entirely, I do not think social media is a bad medium when it comes to discussing politics. For starters, it’s a platform that the youth of America have become super comfortable with. I’m going to level with you – I get a lot of my news from social media. Say what you will about credibility and fake news; social media is fast. The minute Donald Trump gave his most recent speech on the government shutdown, Instagram had videos and photos galore regarding what was said and how it made people feel. Therefore, many people are already using social media as an outlet for news, the expression of ideas and opinions, why not have the politicians be a part of that? Realistically, it would be one of the easiest ways to engage with the public and weigh their responses to concepts or laws that are being discussed. People are so quick to retweet or double tap things that they enjoy or agree with and are equally as quick to drop a bold comment when they do not. Politicians should be encouraged to use social media to voice ideas, promote their agendas and bridge the gap between the public and the public officials. While it can be a double-edged sword that social media is a place that people feel comfortable being their most vocal, that behavior could prove it’s worth when it comes to politics. People are so quick to retweet or double tap things that they enjoy or agree with and are equally as quick to drop a bold comment when they do not. Politicians should be encouraged to use social media to voice ideas, promote their agendas and bridge the gap between the public and the public officials. That being said, as much as they should be encouraged to voice their own opinions, they should be accountable for listening. In the past, if a political figure wanted to block someone who’s opinions they do not enjoy, they had that right. This not only stops the blocker from viewing the blockee’s posts, but prevents the blockee from viewing the blocker’s content as well. More recently, however, in the case of President Trump vs. the Knight First Amendment Institute at Columbia University, federal judge Naomi Reice Buchwald ruled that it was unconstitutional for a president to prevent anyone from seeing his posts on a “designated public forum.” Therefore, the president is no longer allowed to ban anyone simply because they voiced an opinion that may contradict his own. This is very important, as social media in politics should be a two-way street. If the use of these new platforms within the political realm is going to be beneficial, it must be used as a way for our leaders to communicate with the public and vice versa. In this way, social media almost levels the playing field when it comes to communicating and sharing opinions. While it could otherwise prove to be very difficult to directly voice a response to a politician, given their status and rank, platforms such as Instagram brings them down to the same accessibility level as that of any other U.S. citizen. In theory, one could reach out to them the way you would any other person that you didn’t know personally, but wished to communicate with. As our country and its political climate continue to alter themselves, it is important to keep in mind that there is no harm in being public and vocal, much like Ocasio-Cortez, nor is there any harm in embracing new means of communication. It can be bold, and it can be daunting, but it can also make a difference. Though it isn’t a method that has been around for generations, the use of social media is undoubtedly a platform that can enhance the way politics fits into the everyday lifestyle of our ever-changing society.